Let's get one thing straight -- smartphones have been exploding for years. Sure, such incidents are typically rare, and mostly involve fake or otherwise low-quality batteries, cables and or handsets. Samsung has brought the issue to the fore with its Note 7, a device that was poised to become the firm's bestselling high-end phablet but instead finds itself in a one-horse race to the Tech Fail of the Year award. Amid the Note 7's exploding battery shitstorm, we've also heard of other devices suspiciously going up in smoke, including a OnePlus One and several other handsets from Samsung's collection. Now, Huawei has apparently joined the party. Not that it is much of a party. With several major releases said to be in the pipeline, a not-so-timely explosion has occurred of a Huawei handset in the firm's native China. It's suspected that the device in question is the P8 -- the predecessor to this year's Leica camera-packing P9 flagship. 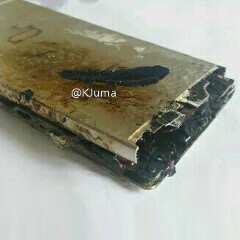 The pictures of the crispy, charred handset that have emerged on Weibo don't include any additional information, so at this point, there's no reason for Huawei or its device owners to panic. If Huawei had a legitimate problem with the P8, we'd surely have heard more by now. The device launched all the way back on April of last year, and with the numerous cases of fake explosions that Samsung has had to deal in recent times, this could well be another instance of folks looking to take advantage. We'll keep an eye out for any further developments with this story. In the meantime, if you do own a Huawei device, there's no need to worry for the time being. Hmmmm. Things are getting really heated this year. That's the result of cheaping out. Most OEMs are cheaping out to make more profit or to keep their devices affordable than competitors. Didn't Steve Jobs declair thermo nuclear war on Android? He's winning!! Something's not right. Now I smell cheap conspiracy. Nope, it's just how it feels. Whenever an iPhone had issues - it was here, there, and everywhere.and there were plenty of trolls to rub it in... Samsung issues though are just extremely consistent and unpresidented - and that's why you see it so often. Nor Apple, LG, Sony, etc messed up that bad - if anything it was isolated. Every Apple explosions or burns were due to chargers not following apples guidlines (were not liecneced). There are plenty of 3rd party $3 chargers all over my house and among the population - they're sold in gas stations, Home Depot and Walmarts. So plenty of chances to have an issue like Samsung currently. If you remember, Samsung tried blaming third party chargers in the beginning of this fiasco - but it turned out to be their own hardware - I bet everyone has at least one or two cheap chargers - this is happening only to Samsung consistently. This hiway phone incedent and other Samsung models I believe are isolated issues (even though I think this is 3rd or 4th s7 burned report this month). Either way I'm sure at least one iPhone somehwnere in China is about to show up on the list - just wait. Well the reason why you know about those issues is because IT WAS TEPORTED!!! So by trojan horse logic it must be a conspiracy against huawei too . Actually there was a story a while ago about a Sony phone that exploded in someone's hand. No piece of electronics is 100% safe from exploding. well yes probably, to be honest with you I have not read that report but like is just one or a very few reports of Sony exploding compared to many reports from iphone and samsung that are major brands... I agree with you in that no piece of electronics is %100 safe every could over heat and explode. I think Htc phones are among the brands that never explode or burn up, at least it's what i think, tell me if i'm wrong..
Looks like only my one plus 3 is safe for now. So it is clear now, Android is the problem. Nowadays devices can be used as firewood, strange things are happening. I would personally not be too surprised if people are doing this to trend or similar to scam, get attention, similar weird stuff has seen before. Or simply getting a free device or 'more' in replacement/compensation demand.